Family dinners were always central to my childhood, both in Manila where I was born and later in the U.S., where we moved to after Dad’s death in 1973. I was a picky eater until I left home; garlic and spicy foods were not an option, and I hated vegetables, although I gradually came around. Table manners weren’t enforced as much, pre-meal prayers were regular (although once I stopped going to church in my mid-teens, I ceased participating in that activity), and I didn’t have my first sip of wine until I was well past thirty. I had beer prior to joining the Navy and thought then, as I still do, that it’s just alcohol-flavored water. I really don’t “get” it, but that’s okay. My mother is an amazing cook, and while I didn’t really watch her in the kitchen, I must have absorbed enough of it to know my way around a knife and a cutting board. I am, for the most part, a self-taught cook, although as a high school student I took a couple of cooking classes. I hung out in libraries though most of the time, and spent a great deal of time reading cookbooks and old Gourmet and Bon Appetit magazines. If there is one ritual that’s remained consistent throughout the years, it is that I’ve always found time to cook, whether it’s breakfast, lunch, brunch, a snack or dinner. I feel that this is a ritual that we’re in danger of losing, because of the helter-skelter lives we live in this day and age. Too many people eat on the go. Lunch isn’t a welcome break in the middle of the day. Speed is valued more than enjoyment. We see the consequences of our choices, reflected in the media by cooking shows that emphasize convenience over time, as if cooking is a tedious chore to be gotten over with as quickly as possible. This is a crazy kind of life; it’s over before you even know it. I think we have to find ways to slow things down. Cooking, eating and sharing food are all delightful ways to slow down. In the end, you may find that the experience of community is time well-spent, and so, it leaves you wanting more. And that’s a wonderful beginning. I really do think that table time is important. Meal times should be a sit-down affair, especially meals with your loved ones, because it provides a much-needed respite from the daily routine. They refresh your spirit. Yes, your spirit — not in a religious sense but in the sense that it helps ‘center’ or ‘ground’ you in what is important, and that is, to spend as much quality time with the people you value most in your life. Cooking is an act of creation, whilst sharing the food you’ve cooked is an act of love. Sharing it with those around you is one of the most intimate and valuable gifts you can give. It’s a gift you can give every single day. Some traditions are worth holding on to, especially in our modern era. What were your family dinners like, when you were growing up? And how much of your food culture and traditions are replicated in your own daily lives? This is extraordinarily easy — Peel 2 large onions and slice thinly. 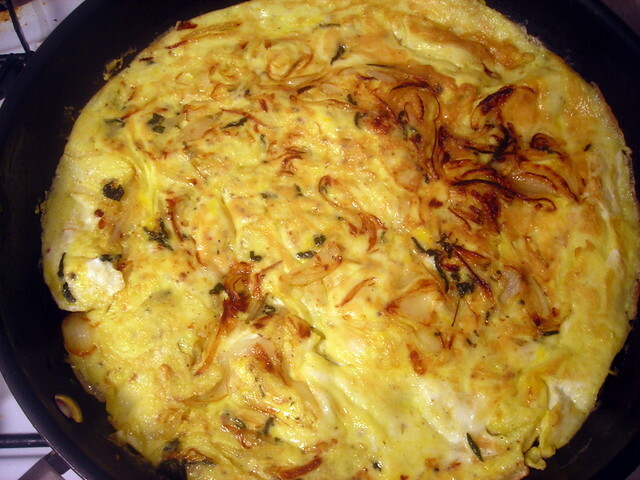 Fry in a couple of tablespoons olive oil in a large skillet over medium heat or until the onions are golden brown. This will take some time, about 10 to 15 minutes depending on your stove. Toss in a few chopped sage leaves. Once the onions are nice and golden, add 3 beaten eggs, seasoned to taste with sea salt and freshly milled black pepper. Pour the eggs over the onion mixture. Cook until the eggs are set, then flip over and cook the other side. You can add cheese if you want — and if you elect that option, you’ll have to finish cooking the frittata in your oven. Pre-heat your broiler to 500 F, transfer the frittata to an oven-proof pan. Lay the pan underneath the broiler for about 3-4 minutes or until the cheese has melted. I usually skip adding cheese if I’m cooking for myself. When the frittata is done, remove from heat. Cut into wedges, garnish with thinly sliced basil and a splash of balsamic vinegar, then serve at once with bread and if you wish, some sliced tomatoes. 28 Jul	This entry was published on July 28, 2012 at 10:30 am. It’s filed under cooking, food, food photography, Italian food, recipe, summer, vegetarian, writing and tagged cooking, dinner, food photography, Italian food, onions, summer, vegetarian, writing. Bookmark the permalink. Follow any comments here with the RSS feed for this post. 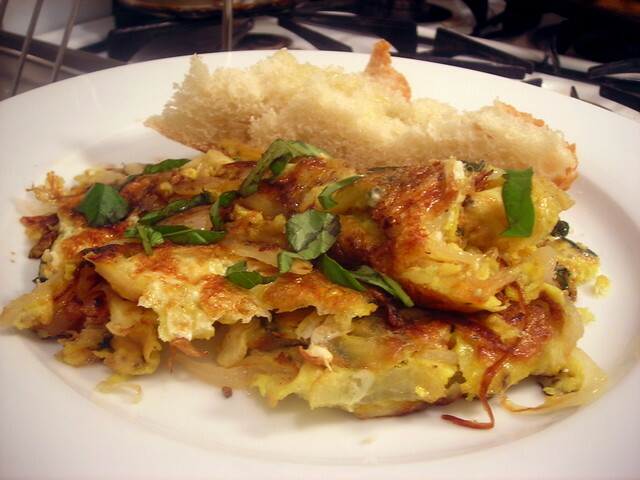 Fritatta… it sounds so much better than deep omelette. Looks wonderful. When I make “breakfast for dinner” I always consider the fritatta. Thanks. Glad you liked it, Donna. Thanks for the comment. Well, I’m always open to being persuaded. Thanks for stopping by, Jenni.